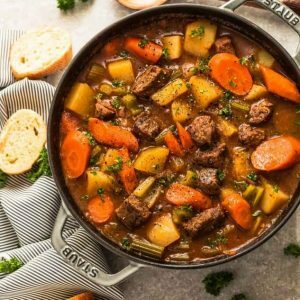 Classic Homemade Beef Stew is the ultimate comforting dish on a cold day. It's so easy to make with the perfect fall-apart tender meat the entire family will love. In a large zip-top bag, combine flour, salt, pepper, onion powder, and seasoning. Add meat and shake until well coated. In a large dutch oven or pot on medium-high heat, add cooking oil and sear the meat on all sides for about 2-3 minutes. You may have to work in batches so you don't crowd the meat. Remove and set aside on a plate. Add another tablespoon of oil, then add onions & garlic to the pan. Cook and saute for about 1 minute, until onions start to soften. Add wine or balsamic vinegar to deglaze the pan. Stir in the tomato paste and cook for about 2 minutes. Add the beef back to the pan then toss in the potatoes, carrots, celery (star anise if using), Italian seasoning, Worcestershire sauce, bay leaf and stir in the beef broth. If there is not enough liquid to cover the vegetables, add water - only as much as needed. Bring to a boil then turn heat down to low, cover and simmer for 55 minutes - 2 hours (depending on your stove), stirring occasionally, until potatoes are tender and meat is tender to your liking. For a thicker stew, in a small bowl, whisk together cornstarch with water. Turn heat back to high and stir cornstarch mixture into stew. Allow stew to boil and thicken up while stirring occasionally. Remove from heat, adjust seasonings and serve hot with fresh parsley.